Calculator Pal app is perfect for balancing checkbook, school work and more. Find it in the App Marketplaces! 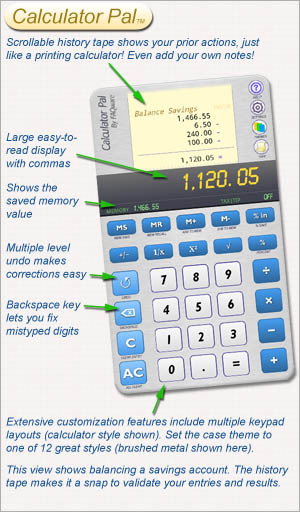 Unique key features make Calculator Pal the best choice for kids, students and adults: history tape with comments, optional key press audible feedback, and undo button now all a single screen. Works like a printing calculator that never runs out of paper. Designed for ease-of-use, Calculator Pal lets you add comments to the scrollable history tape. It's easy to spot errors and correct them with either the backspace button or completely back out an operation with the undo button. No need to flip between screens because it is all on a single screen with big numbers, buttons, display and history tape. Displays 10 digit precision with commas and an operation indicator in amber helps you track what you are doing. Includes popular math functions: 1/x, x-squared, square root making it great for school work! We've added button press confirmation sounds. Six sound effects help distinguish between errors, operation keys, keypad keys, and others. Quickly calculate a restaurant tip or tax without entering the rate every time. Built-in advice with helpful tips. Especially useful because messages explain the correct way to do things if in doubt. Change the look of the calculator to suit your preference by picking your favorite background theme. So, add our handy Calculator Pal to your device, and you'll wonder how you ever got along without it! 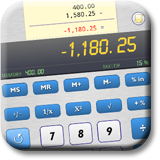 We also offer Calculator Pro specifically designed for users who like our Calculator Pal features and want even more! To re-use the same tax, tip or discount value, enter it once into our exclusive percent memory, and then apply the percent to any value with one button. Personalize Calculator Pal the way you want it! For style, set the background to one of 12 slick themes, from brushed metal, camouflage, charcoal, fire, ice-blue, purple haze, sunset, and more! Change the main display color to suit your fashion. It even allows changing the keypad from the standard 789 calculator layout to a 123 style arrangement.